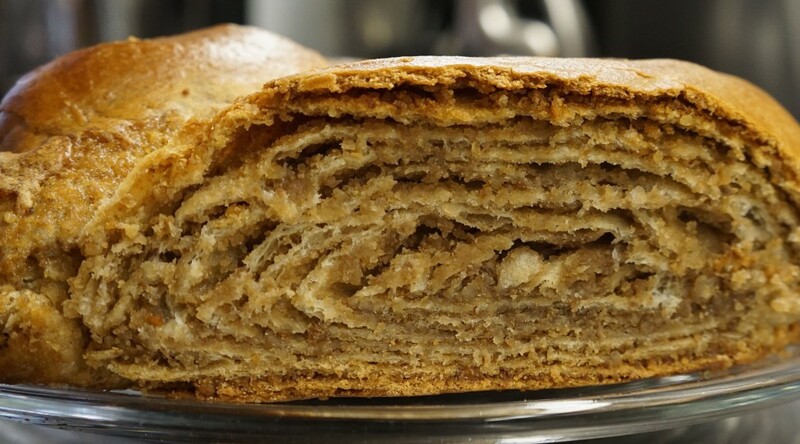 Potica (pronounced poe-TEET-sa) is a Slovenian nut roll, made with a yeast dough. Our family friend Nell Simala taught my sister Mindy how to make this, except Mindy’s mistake of doubling the butter in the dough made for an even better recipe. Now I always make it this way. I would generally recommend doubling this recipe if you are going to the trouble to make this. Knead into a smooth dough, adding more flour as required. The dough will be soft. Put in a greased bowl to rise in a warm place, covered for about one hour. If you find the filling is not easily spreadable when you are ready to use it, add a tablespoon or two of (regular) milk to loosen it up. Cover a table you can access from opposing sides with a clean plastic sheet, bed sheet or tablecloth. Dust well with flour. Place the dough on the work surface. Starting with a rolling pin and switching to stretching it with the back of your hands from the underside (to avoid tearing the dough), stretch out the dough until it is uniformly very thin. It will be thin enough you can almost see through it. After the filling is spread and before it’s rolled up. Trim any uneven edges and place the filling on the dough. spreading it with a rubber spatula or the back of a spoon. If you are careful not to put too much filling, you can spread it to almost every edge, but if you unsure, leave a plain margin on the edge you are rolling towards. Begin rolling the potica and as you approach the last edge, if there is not enough filling, spread more filling to cover that edge; if there’s a buildup of too much filling, even it out.The filling should be clear of a 1-inch margin on 3 sides. Starting from the edge the filling does reach, begin rolling up the dough. You may want to pinch the seam shut and be sure to place the seam down. 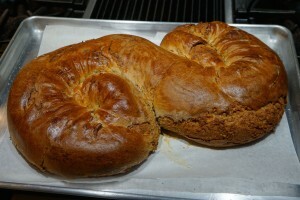 An “S”-shaped potica being brushed with egg glaze. Transfer the dough to a jelly roll pan lined with parchment paper. If it’s too big to fit in a straight roll and it probably will be, make a coil, “s” shape or other shape to get it on the pan. Cover and let rise for 30 minutes. before baking. Bake for 50 to 60 minutes at 350 degrees. NOTE: You may want to work this dough recipe in two sections. I generally double the recipe and would suggest working in 2 or 3 pieces in that case, depending on whether you want straight or curved potica. You can also work the single recipe dough in one large piece, roll it up and cut it in half before letting it rise.